These Trees usually grow to the Height of twelve or fifteen Feet with a Trunk as big as one's Leg, having a pale greenish smooth Bark. Its Leaves are trifoliate, set on long Footstalks. The Flowers grow in spiked Bunches, many of them together, each Flower having four white Petals, and are succeeded by Bunches or Clusters of Seeds. These Trees grow on the upper Parts of the Savannah River in Carolina, and no where that ever I saw in the lower inhabited Parts of the Country. 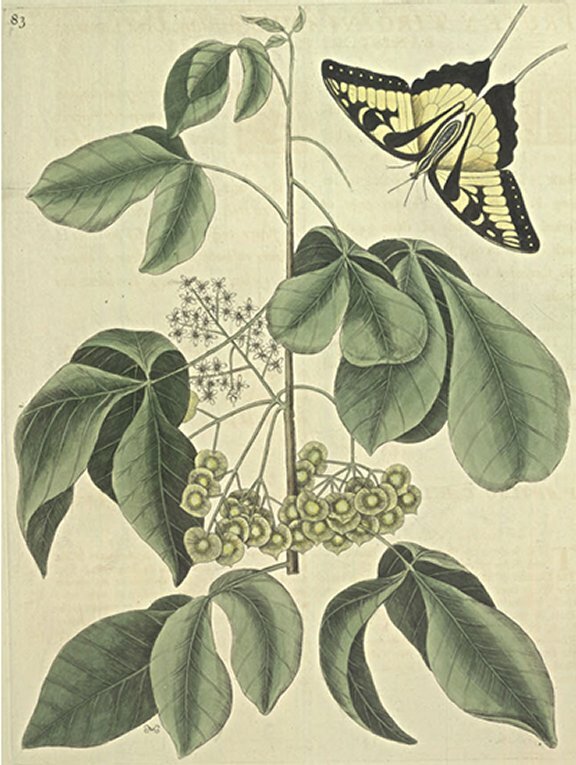 The Body of this Butterfly has its Back black and Sides yellow, the whole Length of it. The Ground of all the Wings is yellow; the two fore Wings have their upper Margins verged with black, besides other Marks of Black. The lower Parts of the four Wings are deeply verged with black, through which in the upper Wings run a Row of yellow Spots: From the lower Part of the two under Wings shoot forth two Tails. These Butterflies are Inhabitants of Virginia and Carolina.